Tyrant Industries - What is HEMA? One of the more difficult questions in the growing community of historical fencers is, What is HEMA? The answer is nuanced, so I have broken it up into two distinct answers. An answer for the general public and an answer for those within the community. For the general public, HEMA is, Historical European Martial Arts. It is the study of martial arts from Europe's past involving swordsmanship, but also other weaponry and even unarmed combat. What makes HEMA unique is that it is guided by the principle of source material. HEMA tries to re-create, not improve upon, techniques. While in other martial arts, each generation tweaks and changes their art in a quest for more efficiency. Hence, jiu-jitsu of the 19th century looks different than the jiu-jitsu of the 21st century. In HEMA, the martial artists are hoping to look like the masters of the past. Efforts are made, not to do something new, but to re-discover something old. HEMA is not meant for daily self-defense. In the past, that was an aspect of it, but today that is not its primary purpose. Modern martial arts often try to re-create situations, such as an alley-way mugging, to help them train. In HEMA the primary purpose of the art was to fight someone else with an equally matched weapon in a sanctioned, or at least agreed upon, venue. 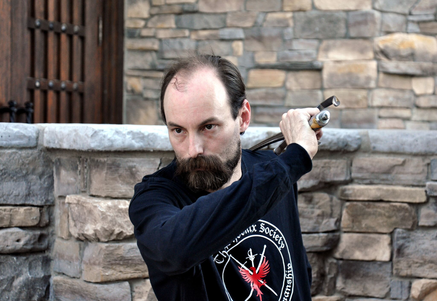 HEMA is source driven and so its more serious practitioners are as much scholars as they are fighters. Sources include actual treatises written by masters of the art, to first hand and second hand accounts, the study of art and the study of skeletons. The sources vary, including pictures and text, but also more esoteric writing that requires other masters of the past to interpret. Dressing up historically can be a part of HEMA, but it's not common. Instead, most clubs have their own uniform and one that they can fence in. While historical clothing looks great, it is generally not something someone wants to fence in because it could be damaged. HEMA is not something often found at the Renaissance festivals around the country, those people are more often actors or stage-fencers. HEMA is not the SCA, the Society of Creative Anachronism, who do not universally practice based off of source material. HEMA is not, the ACL, Armored Combat League, or BOTN, Battle of Nations, who are also not driven by source material when it comes to fighting techniques. HEMA is not LARP, Live Action Role Playing, which are motivated by entertainment, not the use of source material to re-create a lost martial art. HEMA is it's own unique thing with a unique mission in re-creating historical fencing. HEMA has competition as a part of its culture. Groups meet locally, nationally and even internationally, to test their skills against one another. 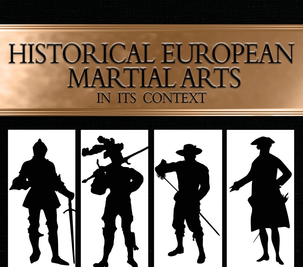 The goal is to try and test our understanding of the lost martial arts of Europe and apply them. There is no better test than fencing another person trying to do the same thing. Rules in the competition are created to help try and guide the fencers to more historical fencing. The HEMA community does not want to see a fencer who does 'whatever' to win, they want to see a historical fencer who wins using the techniques which we study. HEMA is dominated by a variety of clubs and schools. Some are well-established and have a brick-and-mortar storefront, but many others are small bands of dedicated enthusiasts who rent space or meet in public. The HEMA community is small, but growing rapidly. A good way to get started in HEMA is to go to the HEMA Club Finder and the HEMA Alliance website. The HEMA Alliance is a nonprofit organization in the United States dedicated to supporting the many HEMA groups through providing insurance, basic safety rules, communication and even financial support. I once saw a car race. To me, the cars went fast, went around in a circle and one car went faster than another. I once saw a boxing match. Both boxers hit each other, and after 12 rounds one had hit the other more and won. I once saw figure skating. The competitors danced on ice, occasionally people clapped, and a bunch of judges held up placards. It turns out there was a lot more going on than I, the general public, understood. HEMA is no different with endless nuances that make defining it easy for the public, but less so among our own. Is HEMA an art or science? Is HEMA a sport? Is HEMA inclusive of all ancient fighting methods, including those with virtually no direct sources? Can HEMA be improved upon, with gaps being filled in by our own understanding? Does HEMA allow personalization? Among those in the community 'what is HEMA?' will never be solidly defined. My own view is fairly broad, I have a big-tent approach to HEMA, and yet, I know not-HEMA when I see it. Defining HEMA among ourselves is thus a challenge and some universally accepted answer is unlikely. However, for those already involved in HEMA, I do have one bit of unassailable advice for when it comes to understanding what we are. It may sound obvious, but not all people or groups do it to the extent that I think they should. HEMA is source-based and so we should read the sources and try to re-create the techniques within. I find that this is not easy. Many of my students prefer to learn through me and my instructors. It's easier, they can ask us questions, and when it comes to competition and sparring, it works. Yet, I feel that a student of mine who only relies on me is doing themselves a disservice. This is why in my teaching, my seminars, and in my writings, I try to promote source material and with my students, once they know what they are doing, I push them to research on their own. Thanks to this, I have students who study HEMA source material that I don't, and have budding experts in weaponry outside my longsword, saber, rapier, background. 'What are we?' is a question that is much harder to answer than it seems. The internet is awash in controversy after every tournament, or media exposure, or product release, about that very question. I think the answer can be subtle, and this will prevent consensus. However, no one can say we are not source based. Someone might challenge the validity of one's sources, but not their existence. It is the one thing that should bind us all together. HEMA is its source material! Read it, look at the pictures, and pat the researchers and translators on the back. Wiktenauer - An online FREE service with translations and scans of the source material. Historical European Martial Arts in its Context - My book discusses the historical culture of HEMA and its purpose. Includes many photographs, samples and anecdotes. Hardback, full-color. Flower of Battle (Getty) - Translated by Colin Hatcher, this is hardback book has high-res scans of the source material. Hardback, full-color. Polish Saber - My book on the use of the Polish Saber and how I argue for it based off available source material. Hardback, full-color. 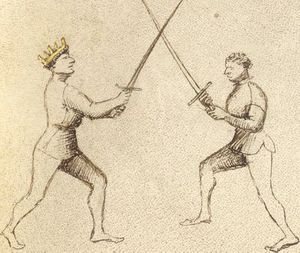 German Longsword Study Gude - By Keith Farrell, a fantastic book and a favorite among the community.